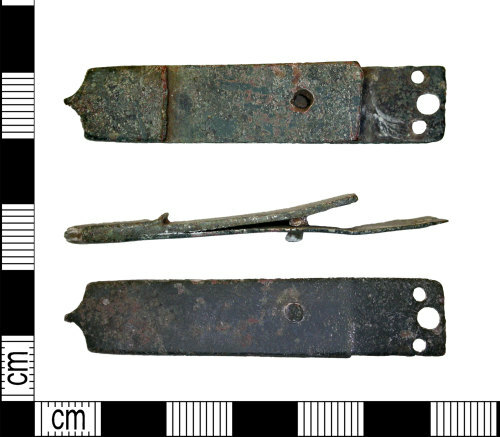 Medieval copper alloy strap end. 59mm in length, 12mm wide and 3-5mm thick with a weight of 9.57grams. The object is rectangular in form and cross section and consists of three plates, It has a large central plate and two thinner outer ones, one of which is only present as a small fragment. These are held together with a single rivet, just off centre. At the upper end it has three small circular holes, arranged in a row with the central one being slightly larger. It terminates in a base with rounded corners and a central pointed projection. The form matches Egan, G. & Pritchard, F. 1991 Dress Accessories.p.93. Dating to 1250-1450.